A Follow Spot: Humana Festival '11, Pt. 3: The ABCs of "Elemeno Pea"
Humana Festival '11, Pt. 3: The ABCs of "Elemeno Pea"
I have sisters. I tend to fall squarely on the side of the Great Unwashed in the class divide. 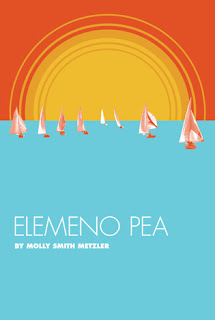 So Molly Smith Metzler's "Elemeno Pea," a comedy which focuses on the conflict between two sisters, one living in her mom's basement in Buffalo and the other lounging in luxury at a beach house in Martha's Vineyard, should be perfect for me. In its Humana Festival production, "Elemeno Pea" was definitely funny, with the behind-the-glass slapstick especially getting the laughs on Michael B. Raiford's gorgeous, glamorous white beach house set. The set-up, when older, poorer sister Devon arrives at her sister Simone's dishy digs, works well, too, as it begins to sink in for Devon just exactly what Simone has been doing and what kind of life she's been leading as a dogsbody for the idle rich. It's only when Simone's boss, Mikaela, too-too-chic, too-too-Housewives-of-Some-Undiscovered-County, barges in that things start to go haywire. Mikaela is written as more than a bit of a caricature, which is fine, but she is so BIG in her self-obsession and bitchery that she also gets to be tiresome. And then, when the play's pay-off hinges on Mikaela's second-act confession that makes Devon rethink her opinion, "Elemeno Pea" definitely strains credulity. The issues raised -- culture, class, stereotypes, ambition, selling out -- are very interesting, however, and I could believe in both sisters. Cassie Beck was blunt and amusing as no-nonsense Devon, and Kimberly Parker Green was also on the money as Simone, who is too fond of the affluent life, with Lilly Pulitzer dresses, fine wine and lobster available for the taking, to care that she's hooking up with a rich "clowntard." And even though they both go to 11, Sara Surrey as Mikaela and Daniel Pearce as Simone's beau do a fine job sending up the rich and making Metzler's point about the superficiality of high society. Metzler's script is full of that kind of verbal humor, with zings and quips from beginning to end. It's funny, for sure, but maybe too bright and zippy to work with the more serious message she's trying to convey.